Over the course of the coming week, Google+ is going to be turning on a new feature that will make commenting and “+1’ing” content a total breeze. When you receive an email notification about your friend’s activity, you can comment and share a laugh straight from your inbox in real time. 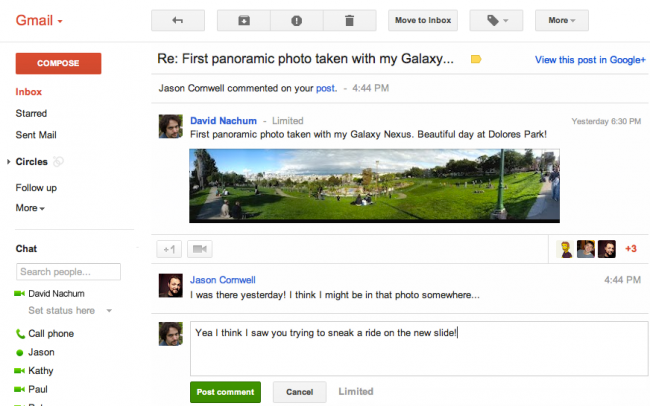 No more dragging your eyes over to the Google+ site to see what’s happening. This should definitely make using Google+ a bit more easy for folks still using it. Verizon to Begin Letting You Text 911 During an Emergency, We Say "It's About Time"